The Eastern Subterranean Termite is the variety that’s prevalent in the New England Area. The termite colony lives underground with a queen and king, which can live up to 25 years. The termite colony consists mainly of termite workers, which are responsible for the termite damage and can number around 500,000. Termite Soldiers with large dark orange colored heads and strong jaws (mandibles), protect the termite queen, king and termite workers from predators like carpenter ants and other ant species. There are only a couple thousand termite soldiers in a colony, but termite workers can quickly change into soldiers when needed for defense. Termite workers travel daily from the wood they are eating to the main termite colony underground by routes known as mud tubes. Termite activity usually goes unnoticed until the termite damage to the wood is discovered during a buyers home inspection or by an inspection from a trained pest control technician. If termites go unnoticed in your home for a period of years, the cost of the wood repair is usually much greater than the cost of a professional termite treatment to eliminate the termite colony from the structure. The most common way homeowners discover they have a termite problem is when they notice thousands of termite swarmers pouring out of their wall in the spring time to mate. Termites usually swarm in the New England area during a two month period from April till May. It's usually on a warm humid day in April or May and can continue for a few weeks until all the termite swarmers have left the underground colony. These female and male termite swarmers are produced by the termite Queen when the colony reaches maturity. They are gathered up by the termite workers in stages and pushed into the most recently used tunnels being used by the workers from the colony to the food source (wood). The workers leave the ends of the tunnels and continue eating the wood and the termite swarmers leave the tunnels and head for any light source. If this swarms happens during the night and a light is left on inside your home, the termite swarmers will mistake the inside of your house for the outside and the swarm will be all over your floor. After they swarm from your foundation or walls, the swarmers will start shedding their wings. They do this so they can mate. They then try to get back into the ground to start new termite colonies. If they accomplish this before they dry-out they can live as new Kings and Queens for 25 –30 years producing up to 500,000 more workers. Finding a pile of dead termites or loose wings is a sure sign that termite workers are active somewhere in the structure. What do termite swarmers look like? Termite Swarmer with wings dropped off To the untrained eye, termite swarmers may appear to be flying ants, but two things will distinguish them from flying ants. 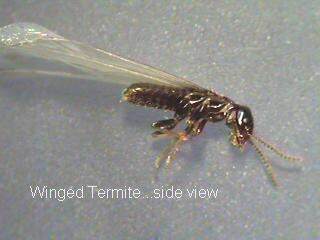 The main difference between termite swarmers and flying ants is the following. The termite body is dark brown or black colored, straight antennae and a one piece body (Ants have 3 segments to their body). Also, you may notice whitish, clear wings on the floor which have been dropped off by the termite swarmers before mating (carpenter ant swarmers retain their brownish wings and have elbowed antennae and are much larger). Since termites eat wood from the inside out, wood with visible external signs of termites is usually beyond salvage. Termite workers require a moist environment to survive and must return to the ground regularly to keep from drying out and dying. They maintain their moisture by traveling inside mud tunnels and by sealing the edges of wood they have eaten. Termites do not require moist wood and can eat wood that appears totally dry. Soft woods are preferred such as pine, fir and spruce, but oak flooring has also been eaten. Treating a structure for termite control is an entirely different process than treating for other insects such as carpenter ants. Ants travel mostly above ground and effective treatments are usually applied to areas above ground, along with locating and exterminating the colony living in your house. Protective perimeter barriers and residuals are applied to kill off foragers. Treatment for termites differs in that we don't look for the colony because it can be up to 200 feet away from the affected structure and deep underground somewhere above the water table, below the frost line or under the house.